Today I'm going to do a weekend reading to take you through December 26th and I'm going to take a break from the blog during that time. Have a blessed holiday. See you again on the 27th! Christmas Weekend Reading: The Angel from the Christmas Tarot by Corrine Kenner. 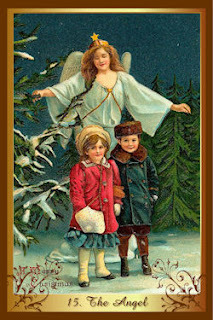 Whether the holidays are a time of loneliness, temptation, sadness or joy for you, know that your angels, guides and loved ones are always "up there" watching over you. If you feel lost, listen for their guidance. If you feel afraid, feel their arms around you. If you feel alone, welcome their presence. If you feel sad, let them lift your heart. And if you feel joy, remember to share it with them. We go through our days oblivious to their presence, but they are always there for us. They will not interfere, but if you ask for their help, they're willing to comply. And while you're talking to them, ask them to help you take better care of yourself so you can get the rest and comfort and nourishment you need during this busy time of year. Happy holidays!